When Destiny of an Emperor was released, like nearly every other game released, it was announced with the occasional advertisement or promotional piece. Of course, being an obscure game at the time, nobody really thought much about this content, though it has become something quite fun to look back upon for people who are fans of the many translated Three Kingdoms games today. We will share any content we can collect on this page. If you find anything fun, please feel free to submit it to us! 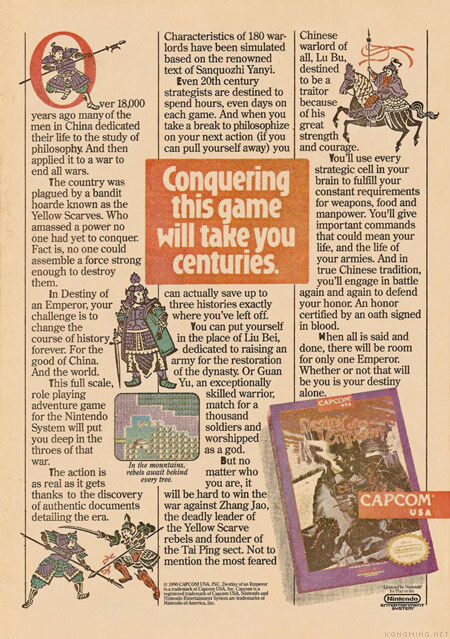 Presenting advertisements that accompanied the original release of Destiny of an Emperor! This is a true gem—an original Destiny of an Emperor official advertisement. Our humble thanks go out to Adrian for scanning this wonderful find! Over 18,000 years ago [they meant 1,800] many of the men in China dedicated their life to the study of philosophy. And then applied it to a war to end all wars. The country was plagued by a bandit hoard known as the Yellow Scarves. Who amassed a power no one had yet to conquer. Fact is, no one could assemble a force strong enough to destroy them. In Destiny of an Emperor, your challenge is to change the course of history forever. For the good of China. And the world. This full scale, role playing adventure game for the Nintendo System will put you deep in the throes of that war. The action is as real as it gets thanks to the discovery of authentic documents detailing the era. Characteristics of 180 warlords have been simulated based on the renowned text of Sanguozhi Yanyi. Even the 20th century strategists are destined to spend hours, even days on teach game. And when you take a break to philosophize on your next action (if you can pull yourself away) you can actually save up to three histories exactly where you’ve left off. You can put yourself in the place of Liu Bei, dedicated to raising an army for the restoration of hte dynasty. Or Guan Yu, an exceptionally skilled warrior, match for a thousand soldiers and worshipped as a god. But no matter who you are, it will be hard to win the war against Zhang Jao, the deadly leader of the Yellow Scarve rebels and found of the Tai Ping sect. Not to mention the most feared Chinese warlord of all, Lü Bu, destined to be a traitor because of his great strength and courage. You’ll use every strategic cell in your brain to fulfill your constant requirements for weapons, food and manpower. You’ll give important commands that could mean your life, and the life of your armies. And in true Chinese tradition, you’ll engage in battle again and again to defend your honor. An honor certified by an oath signed in blood. When all is said and done, there will be room for only one Emperor. Whether or not that will be you is your destiny alone.